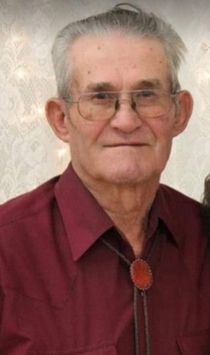 Eugene Willard Witt, age 86, of Danbury, NE passed away at Cambridge Memorial Hospital on Monday, March 18, 2019. He was born near Cedar Bluffs, KS on April 20, 1932 to Clarence Willard and Sarah Opal (Monie) Witt. Eugene attended and graduated from Oberlin High School in 1951. He joined the US Army on January 8, 1954 and was stationed in Fort McClellan, Alabama. He was Honorably discharged on January 6, 1956. On November 21, 1953 he was united in marriage to Beverly (Wurm) Witt. The couple was married at the St. John’s Lutheran Church in Oberlin, KS. Upon his discharge from the service, Eugene returned to Nebraska where he continued to farm. The couple farms Southwest of Danbury, Nebraska and raise Charolais/Angus cattle. Eugene enjoyed chopping wood for their wood stove. He raised a large garden especially potatoes along with farm animals which helped feed his 13 children. He especially liked to be on his John Deere tractors. He enjoyed collecting caps, with over 700 in his collection, advertising pens, and key rings. Family activities were many with school programs and athletic events with his children and grandchildren. He served on the Danbury CO-OP Board and the Indianola CO-OP Board in the past. He was preceded in death by his parents; three sister, Eilene and husband, Art Jones, Delores and husband, Norman Troester, Donna and husband, Bill Goss; grandchildren, Jennifer Mowry and Jessie Mowry; daughter-in-law, Julie Witt; brothers-in-law, Robert and Dennis Wurm. Eugene is survived by his wife, Beverly, of Danbury; seven sons, Darrell Witt of Byers, CO; Ed and Melba Witt of Norton, KS, Gary and Thelma Witt of Culbertson, NE, James and Kimberly Witt of Oberlin, KS, Junior and Kerrie Witt of McCook, NE, Bill and Michele Witt of McCook, NE, Gordon and Gina Witt of Danbury, NE; six daughters, Peggy and Chris Beck of McCook, NE, Ginny and Rod Volberding of McCook, NE, Patty and Dave Chambers of Culbertson, NE, Jan and Rick Mowry of Wilsonville, NE, Cindy and Bruce Howe of Wood River, NE; Julie and Jared Sayer of Cambridge, NE; 69 grandchildren; 72 great-grandchildren and one great-great grandchild; sister, Norma and Delbert Lewis of Oberlin, KS. The family has designated the Red Willow Cancer Center or the Danbury Presbyterian Church for memorial contributions. Funeral services will be held at the Trinity United Methodist Church in Cambridge, NE on Friday, March 22, 2019 at 11:00 AM with Pastor David Kim officiating. Interment with Keith Theobald officiating will take place at 2:30 PM, March 22, 2019 at the Danbury-Marion Cemetery. Military Honors will be held at graveside with US Army Funeral Honors Detail. Visitation will be held at the Lockenour Jones Mortuary in Cambridge on Thursday, March 21, 2019 from 10:00 AM till 7:00 PM. Family will be present to greet friends from 5:00 PM till 7:00 PM. Friends may leave on-line condolences at lockenour.com. Lockenour-Jones Mortuary of Cambridge entrusted with arrangements.